Welcome and Fall in Love with Flavor! Discover how Side Delights® brand of fresh potatoes will surprise you and your family. We continually strive to delight you with new, innovative products to fit every meal as well as delicious recipe suggestions. Enjoy! Healthy & delicious fresh potatoes — the ultimate comfort food! For the “I’ve got 15 minutes to make dinner” crowd. When you want to impress someone with your cooking skills. Restaurant-style French Fries and Potato Chips are Absolutely Irresistible…especially when you make them at home! Beautiful, organic potatoes that are USDA certified organic. Potatoes plus FLAVOR! 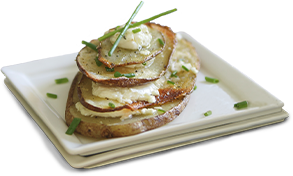 Potato kits deliver wholesome potato goodness with seasonings to please. Holiday luxury or a weeknight splurge, either way, this side dish is straight-up delicious. Hello St. Patrick's Day favorite! Super delicious, super cool looking potatoes in the Slow Cooker...finally!